Kidnapped continues the saga of Chuffnell Hall. 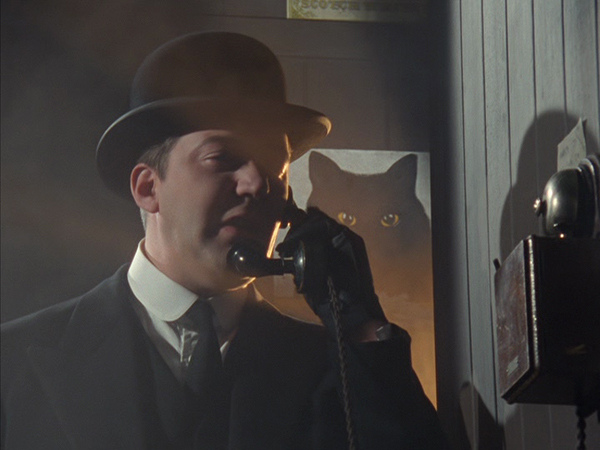 Having said of 2.4 that the best Wodehouse adaptations tend to stick closely to the text, this one is an exception that proves the rule, diverging significantly yet still scoring with its highly preposterous additions. 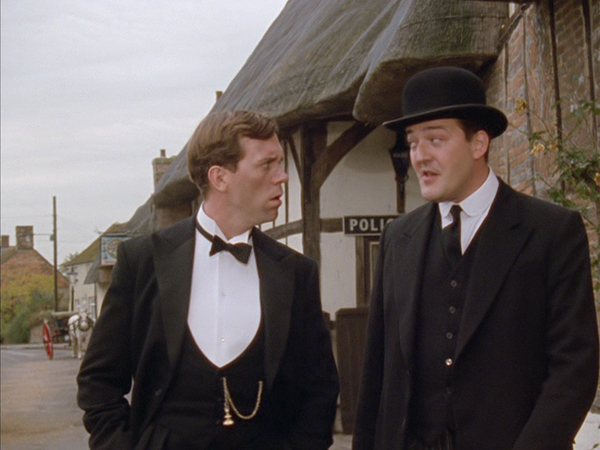 Jeeves: Tis old boggy. He be abroad tonight. He be heading for the railway station. Gone are many of the imbroglios involving Stoker and Glossop (the estimable Roger Brierley), including the contesting of the former’s uncle’s will. 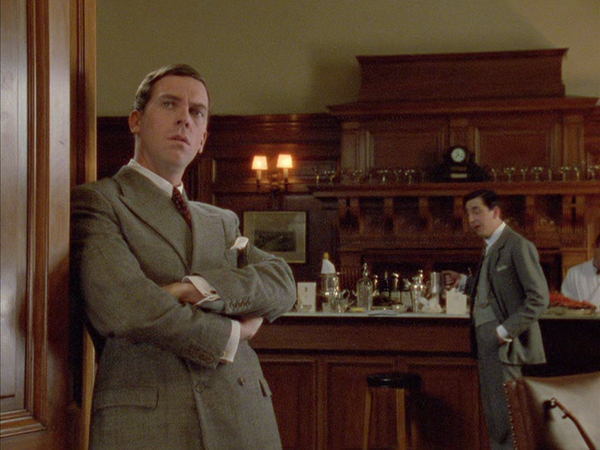 Also gone, sadly, is the inebriated Brinkley throwing potatoes at Stoker, which surely would have been enormous fun. 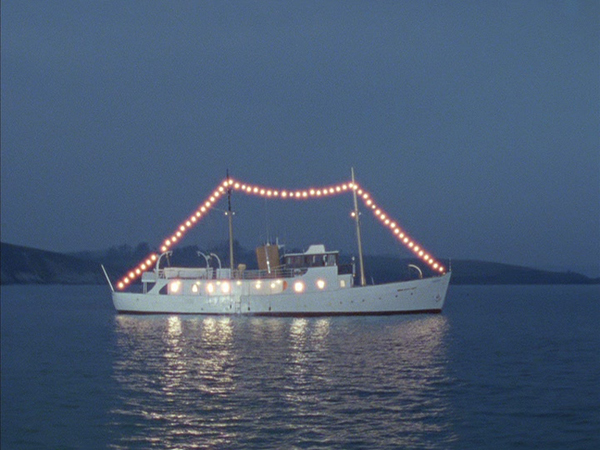 Instead, we concentrate on Bertie being locked aboard Stoker’s yacht in order to secure his marriage to Pauline (as per the novel), Chuffy tailing Pauline in disguise (so there’s a different/additional reason for Stoker to believe Bertie and she spent the night together, this time at a pub en route to Chufnell Hall) and the positively inspired “Boggy be about” plotline, in which some of Plum’s rather less politically correct, by today’s standards, plotting is alleviated by redirecting it into depicting some ignorant Devonshire yokels, always an acceptable target. 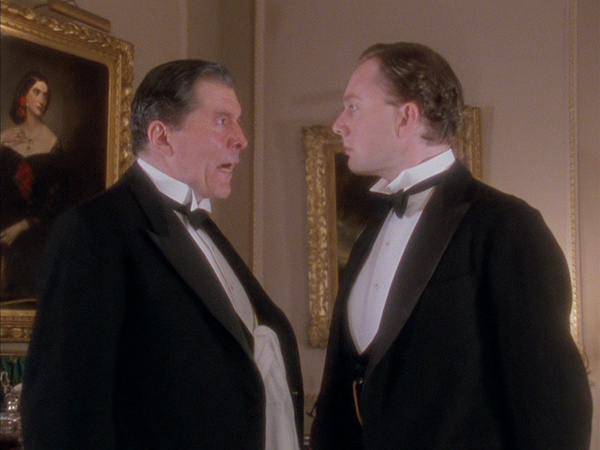 Seabury: Well, I think you tell rotten jokes, you can’t sing, and you look completely stupid. 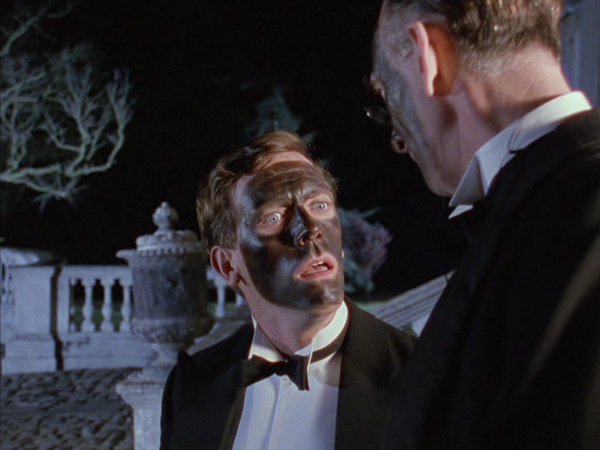 Enough of the Glossop plotline remains intact, in which Stoker plans to sell him the hall to be used as a sanatorium, including the thawing of his relations with Bertie after both mutually agree on how horrid Seabury is (Glossop, having donned blackface to entertain the little squirt as a minstrel, is inspired to clout him one after enduring endless insults). 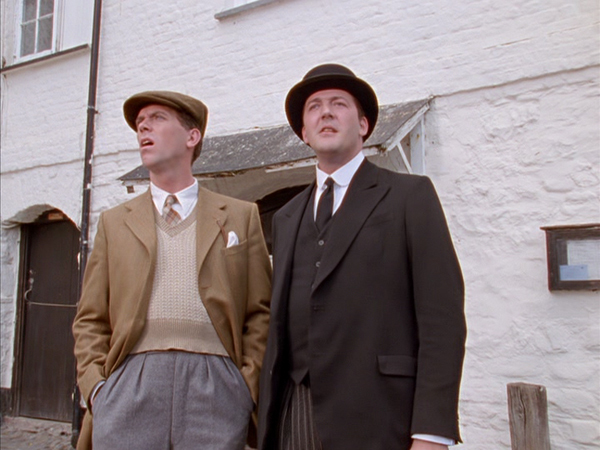 Of course, Glossop is married in Jeeves and Wooster, so the book’s subplot regarding his potential union with Chuffy’s Aunt Myrtle – now his sister - is gone (Jane Downs is just dynamite as Glossop’s wife anyway). 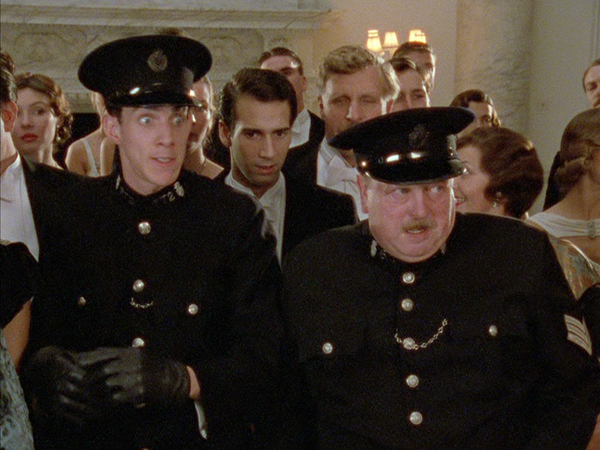 Constable Dobson: You mean some of them creatures up there is not boggys? Sergeant Voules: Some of thems is as human as you or me. The question is, which ones? 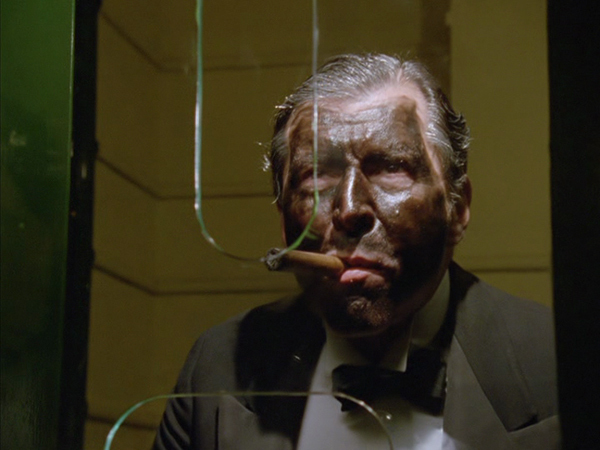 Ah yes, the blackface. 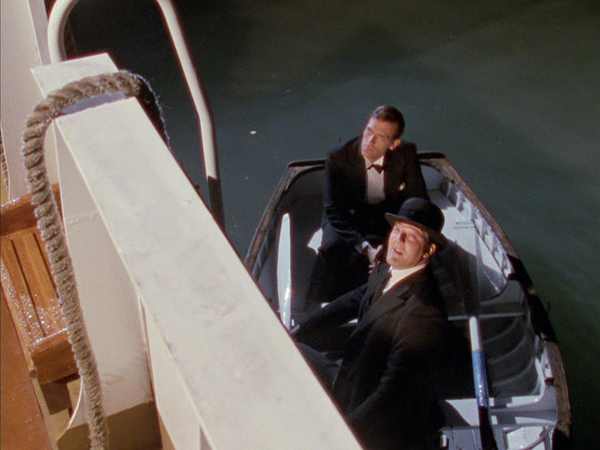 In Thank You, Jeeves, Bertie escapes Stoker’s yacht, as here, by donning boot polish and slipping away with the minstrel act. 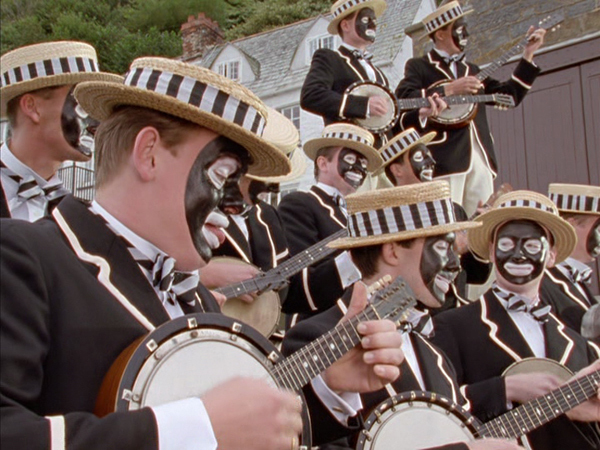 Only they’re an actual all-black minstrel group, which wouldn’t translate so well nearly 60 years later. 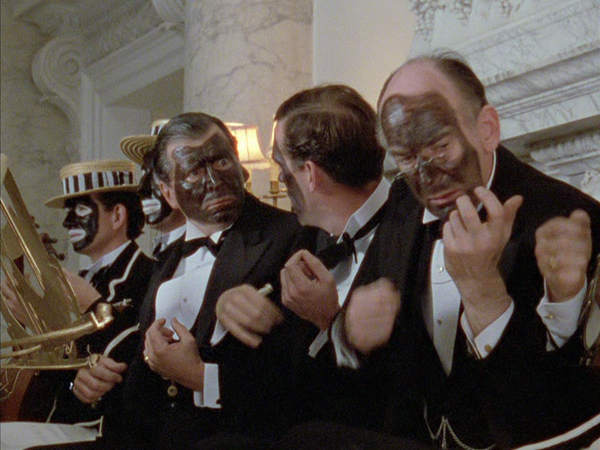 This episode was shown 13 years after The Black and White Minstrel Show shut up shop, so Barmy and gang dressing in blackface might generously be assigned the status of relatively innocuous period piece trappings without condoning the essential racism of the practice. 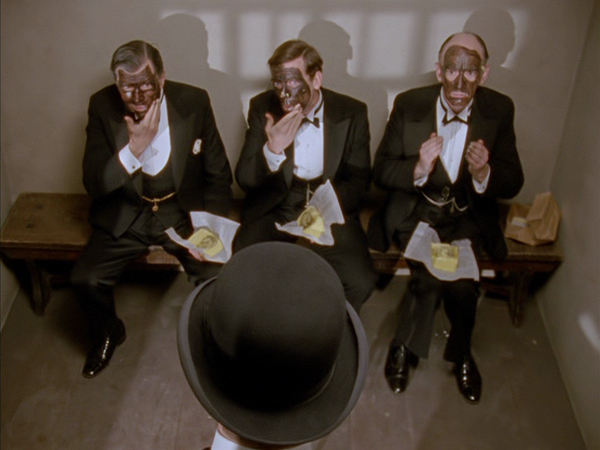 Although, the qualifier shoved rather gracelessly into the piece, whereby Jeeves notes of minstrel acts that they are “said to originate, sir, with the entertainments got up on the cotton plantations of the new world, by the slaves employed on those facilities, in order to express joy and happiness at their lot. An unlikely contingency one surmises, bearing in mind their situation” doesn’t really address the use of blackface itself. Exton is caught between the stools of acknowledging the inappropriateness of the entertainment while simultaneously wishing to ignore its ramifications for the purposes of an enormously silly plot device. And for the purposes of said plotting, it’s an undoubted winner, as Bertie mingles with the minstrels, engaging in a spot of Lady of Spain, and escapes from the yacht while Jeeves, aware that “Old Boggy walks on Lammas Eve”, makes a covert phone call alerting the local constabulary to the creature’s presence. 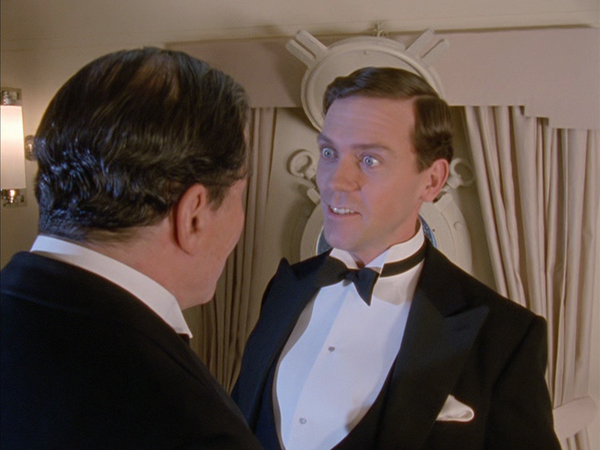 The results find various parties mistaken for Old Boggy, including Stoker (persuaded to don blackface by Jeeves as camouflage in his hunt for Bertie, an idea that doesn’t really wash-burn, any more than the butter used to get rid of the polish), leading to Voules and Dobson hunting Boggy down to Oofy Prosser’s parents’ bash, where the minstrels are performing next. 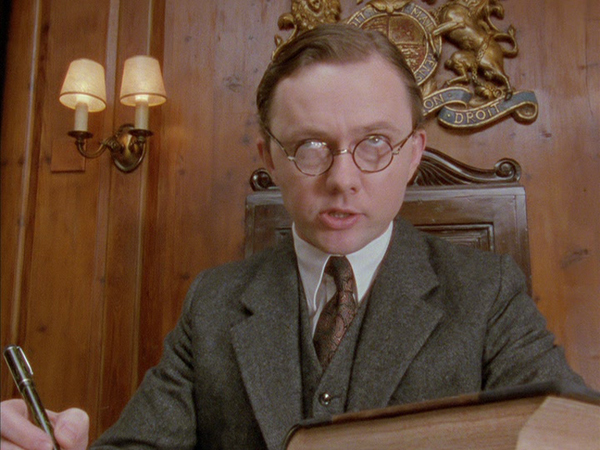 The resolution is economical and attractive: with the various Boggys all banged up, Stoker and Glossop can be let off by the magistrate, because, luckily, he is Lord Chuffnell. Chuffy: Bertie once dropped a blancmange on the Bishop of Woolwich, when we were at Oxford. 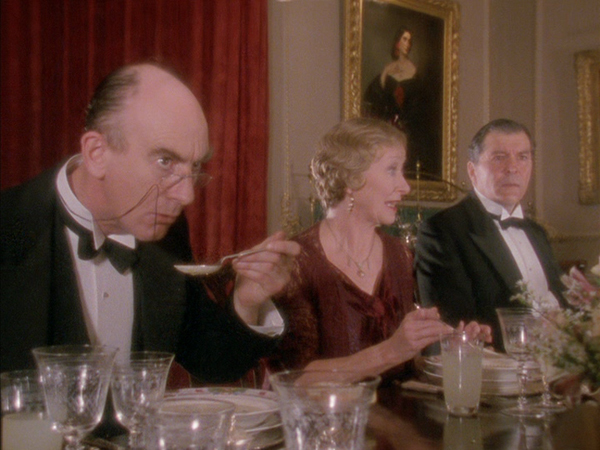 Director Langton has fashioned a very sprightly visual narrative from Clive Exton’s teleplay, fully alert to the slapstick potential, and there are numerous amusing diversions en route, from the neat dovetailing of Bertie being ineligible for the chairmanship of the Drones’ dining committee (because he has a criminal record) to the resolution in which all those who might put themselves forward also now have a criminal record, to the anecdote of Bertie and the bishop and the blancmange, (“He looked up to see what was happening, fell straight into the Cherwell”, much to Stoker’s disapproval (“I don’t find this funny”; “No? Well, you had to be there”). The replacement of banjo with a trumpet in the previous episode, meanwhile, is acknowledged by Oofy’s band’s playing (“Women and children are huddled in frightened groups as far North as Grosvenor Square”). 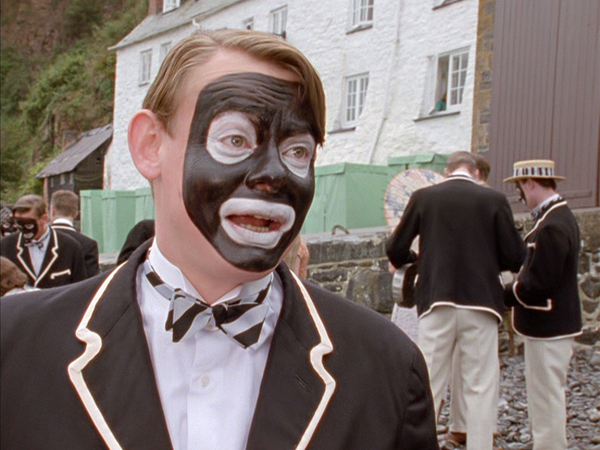 Martin Clunes is on hand to make Barmy a peerless idiot (“I finished miles ahead of you fellows” he claims proudly, having completed their practice song first; later, he puts his hat on, busked coins still in it, and observes his mother will be absolutely thrilled, “She’s always saying I should work for a living”). Stoker: Means well? A man who makes a mockery of the church? A jailbird? A womaniser? A drunkard? 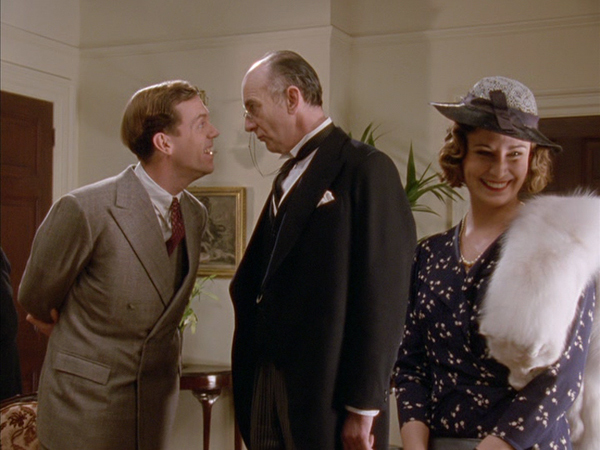 The result is one of the series’ broadest and most satisfying episodes, acknowledging old favourites (giving a false name to the court – “Quiet, Dr Crippin!”) and ending on a just-about happily ever after: we see Chuffy and Pauline arguing, with Jeeves observing, “I imagine the young couple will spend much of their happily married lives in a state of similar emotional turmoil”.